Join Eddie and Kristin for 4 days of self exploration. Yoga is the path to freedom and a path to the self. Each time you practice, you are giving yourself the opportunity to heal, to look deeper within, to go inside and to explore your personality and what is going on in your body. We all have congestion in the body which leads to congestion in the mind. 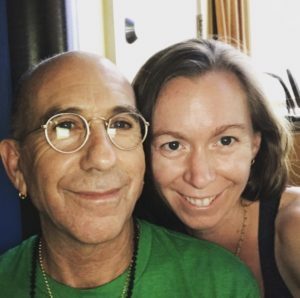 Over the course of the 4 days, Eddie and Kristin will guide you through several practices that can lead you closer to stillness and stability of body and mind. Their approach is to teach individuals within a class setting so that you can leave with some insight as to what would be good for you to practice at home. This is an all levels workshop! Eddie Modestini has been teaching yoga since 1983. He has been certified in Iyengar Yoga and was authorized to teach Ashtanga Yoga by Sri K. Pattabhi Jois. Eddie is gifted with an excellent eye for detail and a profound ability to read student’s bodies for injury and misalignment. He is a master in the asanas and is considered to be a teacher’s teacher. He currently studies with HS Arun and Manouso Manos, cultivating the inner experience in his practice and sharing that with his students. Kristin Bosteels has been practicing since she was 19 years old. She is a breast cancer survivor whose passion is yoga for women’s health. She is healing herself with yoga and inspiring others to do the same. She studies extensively with Senior Iyengar Yoga Teacher, Manouso Manos and partner Eddie Modestini. 9-11:30 : Standing Up for Your Life! 9-11:30 : Change your Perspective, Go Upside Down! Limited spaces available, click HERE to reserve your spots today! Standing Up for Your Life! : Standing poses are the foundation of the practice. We cannot build the temple for which our soul resides on an uneven foundation. Using support, we will cultivate a solid foundation through both our hands and feet so that we can build a solid practice for our future! Intro to Pranayama : Pranayama means the elongation of the breath. In this session, students will learn the preparation for pranayama and a series of breathing techniques that can help to improve health and bring longevity to ones being. Pranayama is a profound practice and we are excited to share this with the Invati community! Healthy Backs: Many people are living their daily lives with some amount of back pain. Whether it is a nagging pain or more intense jarring pain, back pain makes it very difficult to live your best life. Join us for an exploration of poses that can help to relieve back pain and bring more joy into your life! Hip Openers : In this class we will explore the hips and pelvis using a combination of standing and seated hip openers. Due to the nature of our society, it is common to have stiffness in the hips. This can lead to lower back problems as well as knee and ankle problems. Freedom in the hips gives us access to a more creative experience in life! Change your Perspective, Go upside down! : Inversions are the corner stone to one’s yoga practice. The inversions are the poses that bring balance and health to the body. We will explore the preparation for Sirsasana(headstand) and also the practice of Salamba Sarvangasana(shoulder stand). Students will leave this class with an idea of what inversions practice would be best for them. Relax Deeply : Get ready to relax and unwind. In this class we will guide you into a deeper meditative state in the postures. Some of the postures may still challenge the body depending on the individual but you will be guided into finding comfort through relaxation. Intro to Pranayama II : Here is another chance to learn the breath with us! Students do not need to have attended the first pranayama class to attend this one. Pranayama means the elongation of the breath. In this session, students will learn the preparation for pranayama and a series of breathing techniques that can help to improve health and bring longevity to ones being. Pranayama is a profound practice and we are excited to share this with the Invati community! Backbending into the present moment! : When you start to move into a backbending practice there are not a lot of places the mind can go except for the present moment! Backbends bring a sparkle to ones eye, inject us into the present and can help us work through difficult times in our lives. Join us for a session of diving deep into the profound practice that is backbends! Twists to unravel the Spine and Shoulders : Twists have so many beautiful and profound benefits! Join us in exploring twisting for the release of the shoulders, for the wringing out the internal organs and bringing length to the spine!